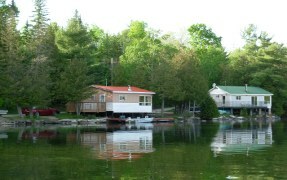 We rent nine cottages located on the west end of Palmerston Lake. 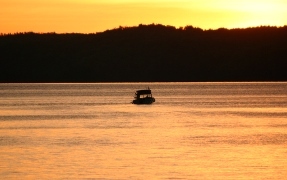 Palmerston is well known as a spring fed lake with clear cold water and great Lake Trout / Bass fishing. The lake has numerous islands, small quiet coves and undeveloped shoreline for your boating / swimming pleasure. All cottages are fully equipped with indoor facilities. There are both two and three bedroom units. All are well spaced and located on the water’s edge with dock space provided. How close to the water are they – well at several units you step off your deck into your boat. Most cabins include wood stoves to provide heat during the spring and fall seasons. Three fully winterized cottages also have oil furnaces. We have boat & motor, kayak, canoe and paddle boat rentals; and our own private concrete boat launch. Docking facilities are provided for guests. 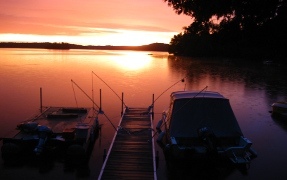 Palmerston is well known as a spring fed lake with clear cold water and great Lake Trout / Bass fishing. Enjoy the numerous other lakes in the area and also the thousands of acres of crown land with easy access immediately north of West Palmerston Cottages. Fish speckled and rainbow trout on the smaller lakes or visit some of the large lakes to fish pike, pickerel and bass. Lakes range from easy access with boat launches to remote access by ATV, snowmobile or hiking. 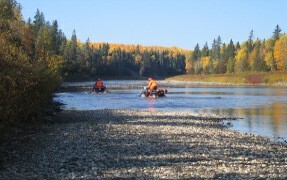 We are located directly on the groomed snowmobile trail network and also on the ATV trails. We also have 300 private acres for your hiking / exploring pleasure. Welcome to West Palmerston Cottages at Ompah. This four season resort has been owned and operated by the Sproule family for over twenty years. We rent nine cottages located on the west end of Palmerston Lake. Palmerston is well known as a spring fed lake with clear cold water and great Lake Trout / Bass fishing. The lake has numerous islands, small quiet coves and undeveloped shoreline for your boating / swimming pleasure.